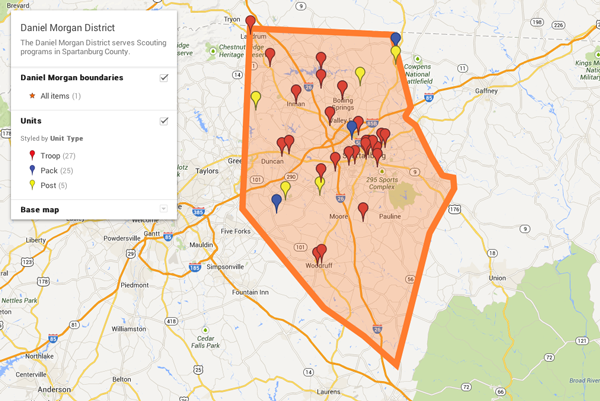 The Daniel Morgan district serves Scouting programs in Cherokee, Spartanburg, and Union Counties. In 2015, this district placed as a JTE Gold district. The Commissioner Staff Meeting is held at 6:00 pm on the second Thursday of every month at First Presbyterian Church, Kennedy Street Annex, Spartanburg. The District Roundtable is held at 7:00 pm on the second Thursday of every month at First Presbyterian Church, Kennedy Street Annex, Spartanburg. The District Committee Meeting is held at 6:30 pm on the last Thursday of every month at First Presbyterian Church, Kennedy Street Annex, Spartanburg. Eagle Boards will meet on the 2nd Tuesday of each month at 7:00 PM at First Presbyterian Church. Project Approval Reviews will be held on the 3rd Thursday of each month at 7:00 pm at First Presbyterian Church. Eagle Board Procedures and Resources. Addendum to Procedures, for Scoutmasters.